In Ojos de Agua, a small rural community in Mexico, children begin to work from a very young age to help support their families. They go to school in the morning, and many go to the fields or other places to work in the afternoons and on weekends. Half of households only have one parent, the other having left to find work in the U.S. As the children get older and their earning potential increases, they drop out of school completely, with most not making it past 9th grade. We identified a significant problem when we became curious about what the children do with their free time. We were disappointed to learn that there are no parks or playgrounds in this small town. There are no suitable spaces for the kids to run around, engage in sports, exercise, play or just be kids. The time spent outdoors is on the street, and almost always unsupervised. Having a community playground where childhood experiences are cherished, and a space where to exercise would create an attachment to it by those who enjoy the facility. A place will always be significant to a child if fond memories of it are formed during their early years. Having this kind of connection to their community serves as motivation for people to improve it. Job creation and self-sustainability are potential outcomes diminishing the need for so many people to migrate. We believe that the foundation to a strong economy is education. Walls that Unite seeks to enhance the quality and accessibility of educational experiences. In March of this year we began a campaign to raise money to build a sports complex in Ojos de Agua. The complex includes a playground, soccer field and picnic tables. The playground will provide a safe, enclosed space where young children can run around. Imagination will encourage creative play, important for social and emotional development. Parents would spend quality time with their children. The construction of a soccer field will offer promise to many. Children who participate in sports or are physically active perform better in school, increasing high school attendance and graduation rates. Strong relationships with coaches and friends are created on the field. Discipline and determination can be applied to school work. Physical activity increases a child’s ability to concentrate and promotes healthy eating habits. As there are no soccer fields near Ojos de Agua, this field would serve as a gathering place for surrounding communities in a country were soccer is a way of life. There are no public spaces to congregate in Ojos de Agua. No restaurants for people to gather to learn about the daily happenings of the town. Along with the playground and field, the picnic area would provide an opportunity for families to come together and build community, to share the space and get to know each other. Several participants have gained the confidence to do service abroad. Many visited Ojos de Agua in July to lead the children in creating artworks that have roots in the indigenous cultures of western Mexico. The children received a lesson on the significance of the objects, inviting discussion of diversity and identity. Later that day the volunteers hosted a movie night for the children. This was immensely popular as they all wore their pajamas and were given popcorn. On a separate occasion, another participant visited Ojos de Agua and held printmaking workshops. The theme of the lesson was migration and the children created stickers that emphasize the importance of water for people who cross the border by foot. A few weeks later the Walls that Unite participant dropped off water bottles at water stations located at the border. On the bottles were the stickers the children had made with their names and the name of their town. The impact of the educational experiences we organize has trickled down from college age to teenagers. Walls that Unite was asked by high school students in Ojos de Agua to come to the school and talk about the work we do so they can organize activities for the younger children in the community. We would like to see an increase in service initiatives, which would require more people to become participants. We want to recruit people who are excited about being part of the bigger picture and who want to lead and create change. We are also looking to form strategic partnerships with people or organizations that have ties to the U.S. and Mexico and who can support projects in either country. We will continue our efforts to help strengthen U.S.- Mexico relations that have been deteriorated in the last year so that intercultural educational exchanges and collaboration can continue to take place. To help us achieve this we need to be part of a network that can open doors to dialog with influential people where connections can be made and shared. Being part of a group provides opportunities to share ideas and knowledge and insight to different points of view. 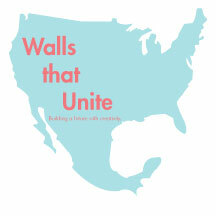 Walls that Unite would receive exposure, raising the organization’s profile. Belonging to a network also offers support and resources to continue to innovate and continue to be inspired and motivated.